On 27th August 2014 there will be two moons on the sky. The whole world is waiting for it. On this day Mars will be very bright and like moon everyone can see it with naked eyes. This day it will be 34.65 M Miles away from earth. On this day, do not forget to see this at 12.30 night. 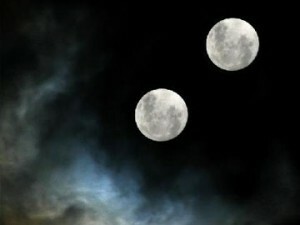 Because you will see two moons in the sky. This event will happen again in the year 2287. Please share this with all. Because those who are living now cannot see it second time in the year 2287. Is your WhatsApp abuzz with these message. Don't believe and don't spend your midnight's oil waiting to watch these 'wonderful' moons. This is the is old Internet hoax and has been fooling many every year. Several Planetarium officials have described the message as hoax.